This is a DRAFT so there will be many changes and additions. First of all, I would like to thank Bob and Patti Duncan for helping me around Whitby, Fireco, Jonben, Willabet and Coal City. Their support made this trip possible and certainly more enjoyable. If you want to know about the history of Whitby please see the link to the main Whitby page at the bottom or click here. Additionally, Pattis knowledge of the Tolley family was invaluable. Secondly, Thanks to Dee Wheaton and her unique historical book "The Whitby Halsteads". This book is incredible as far as depth and detail of the Halstead family and its history. None of the following information would be possible without Dees book. Third, and not at all least, the folks at the Tolley Surname Board, Lynn Sanderson and Dorris Tolley made almost all of the research I was doing on Juliana Tolley come together. Not only were the Tolleys and Halstead friends they were also family by marriage. The pictures below of the Halstead cemetery were located very near one of the original Halstead settlements in what would become Whitby. The stone below is of Alexander Halstead, Whitby's first settler. 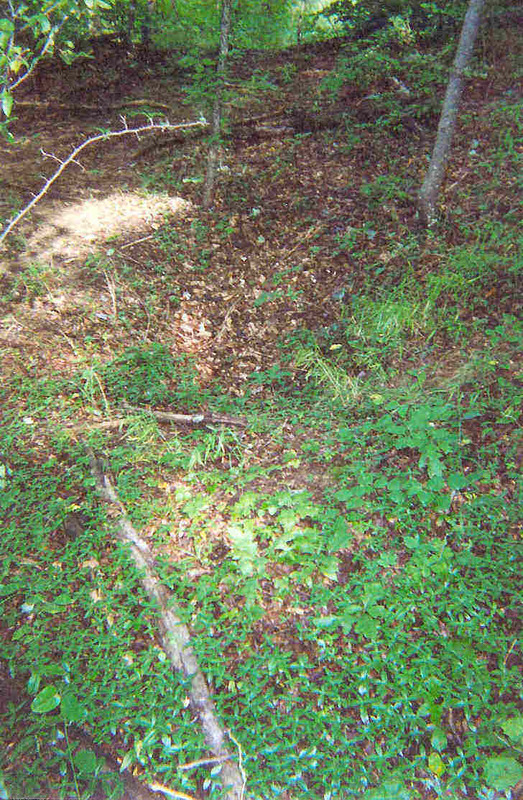 The Halstead Cemetery as it exists today is very much a part of the landscape: Wooded and very difficult to see. The cemetery as created, was within sight of the original Halstead farm. 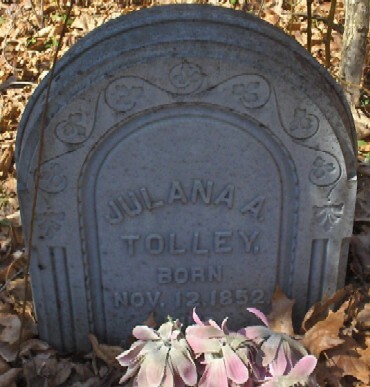 Juliana Tolley, daughter of Callahill Tolley. Callahills brother was to co found the town of Jon Ben. Callahill Tolley, father of Juliana Tolley, had a brother named John Jessee Tolley. This was the John Tolley whose name became part of Jon Ben. He was a co founder of that town. John Tolley was married to Amanda Arabella Massey. 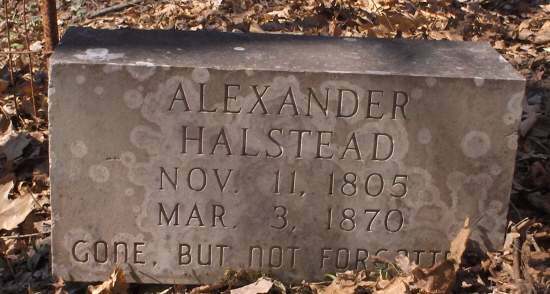 Coincidentally, William Edward Halstead, son of Alexander also married a Massey woman. They were in fact sisters. So much history in such a small place.